Rising temperatures just make the Arizona Rollergirls skate harder. Season 4 has been hot, hot, hot. 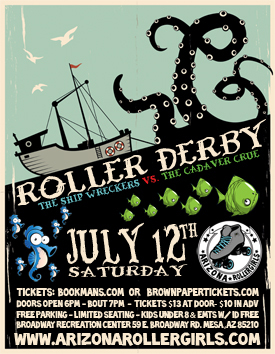 Bookmans invites you to cool down with us at 7 p.m. on Saturday, July 12 as The Ship Wreckers take on The Cadaver Crue. The Arizona Rollergirls skate at The Broadway Rec Center in Mesa and tickets are available at all Bookmans locations. Come see the greatest show on skates. Celebrate the first bout of the season with face painting, 50/50 raffle, live-action fights, suicide seating and hot derby chicks wait your attendance. Papa John’s Pizza will sell $2 slices. Free parking and admission for EMTs with a valid picture ID. To enter our Ticket Tuesday giveaway, share with us your summer experience. What do you do to beat the heat? We will select a five winners using random.org. Winners will be notified by e-mail sometime on Wednesday or possibly even Thursday. We will contact you by e-mail so make sure it is correct. Comments are moderated and may take some time to appear. Please do not resubmit your comments — one is plenty.